There is a reason “stickers” are called “stickers”: They stick in people’s memories. A simple, cost-effective branding tool, stickers are a great way to promote your business in a direct and memorable way. There is a reason “stickers” are called “stickers”: They stick in people’s memories. A simple, cost-effective branding tool, stickers are a great way to promote your business in a direct and memorable way.Your stickers are supplied on easy-peel sheets, with rounded corners for ease of removal. They are ideal for all indoor use, so stick them to anything related to your brand and hand them out to everyone. As with everything to do with business, application is everything! Imagine your logo and contact info advertising your business on: Sandwich Wraps, Drink Cups, Bundles of Flowers, Shopping bags, Bags of coffee, sweets, anything to go, Bottles Shipping Boxes, Envelopes, CDs, Gift Wrap, etc. Stick on a cheerful “Thank You” to your customers every time. A sticker can turn a plain ol’ piece of paper into a receipt, an invoice, a thank you note. They make easy work out of mark-downs and sales, too. We’ve got what you need. 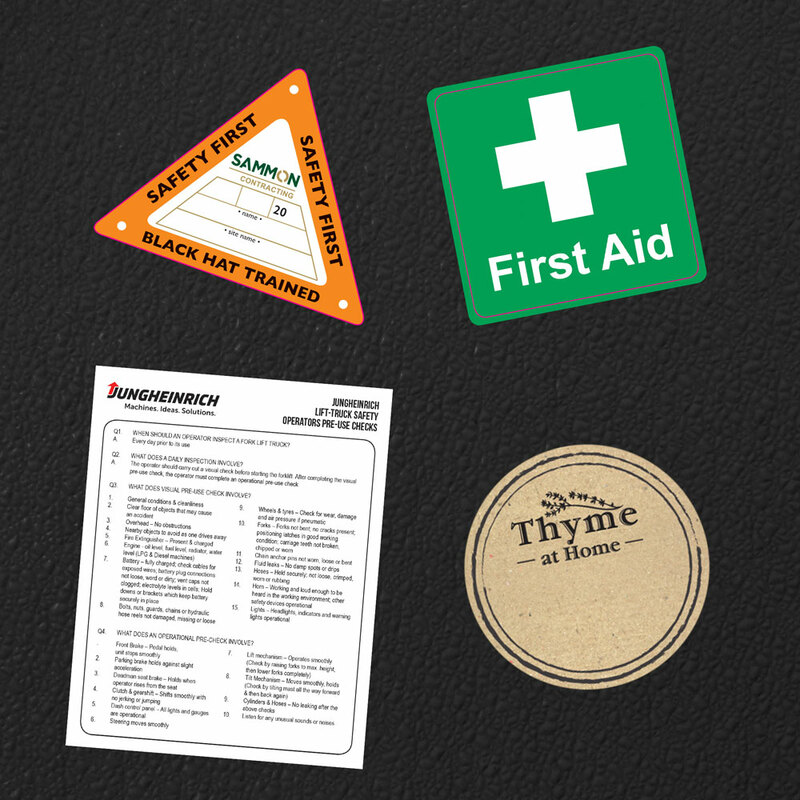 Our stickers come in all shapes and sizes – we have just the right one for your product. They’re delivered direct to you on easy-peel sheets so you can stick ’em as fast as lightning. Don’t miss ANY opportunity to promote your business. You won’t find a more affordable way to raise brand awareness than our stickers. They’ll do more talking than your Auntie Mary after a glass of bubbly. Be the first one in town to get them! We now stock metallic coloured stickers, available in gold or silver.